A Quiet Place was directed by John Krasinski, who starred opposite his real-life wife Emily Blunt. Noah Jupe (Suburbicon, Wonder) and Millicent Simmonds (Wonderstruck) round out the cast. In the modern horror thriller, a family of four must navigate their lives in silence after mysterious creatures that hunt by sound threaten their survival. If they hear you, they hunt you. The film has minimal dialogue, because silence is survival. Since opening in theaters on April 6, it has grossed over $213 million worldwide on a $17 million dollar budget. Top Gun: Maverick is the sequel to the 1986 hit, with original cast members Tom Cruise and Val Kilmer reprising their roles alongside Glen Powell (Hidden Figures), Jennifer Connelly (A Beautiful Mind), Miles Teller (Whiplash), Jon Hamm (Mad Men), Ed Harris (Westworld), Lewis Pullman (Bad Times at the El Royale), Thomasin McKenzie (Jojo Rabbit), Charles Parnell (A Million Little Pieces), Jay Ellis (Insecure), Bashir Salahuddin (GLOW), Danny Ramirez (Assassination Nation), and Monica Barbaro (The Good Cop). 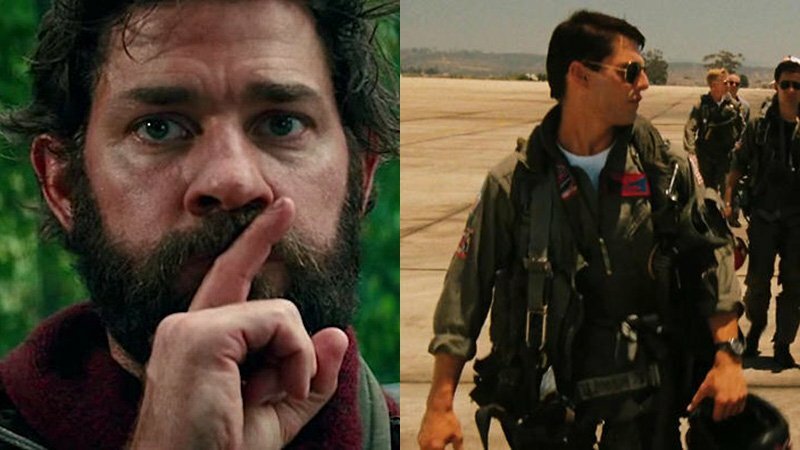 The post A Quiet Place Sequel & Top Gun 2 Set for 2020 Release appeared first on ComingSoon.net.